Agents often influence customers into buying new products every year instead of continuing with their existing policies, says Priyadarshini Maji. 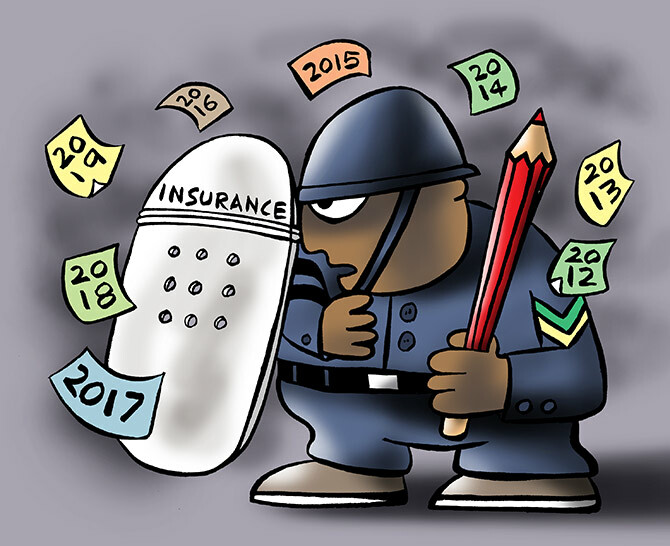 A working committee set up by the Insurance Regulatory and Development Authority of India (Irdai) is currently examining the issue of ushering in level commissions throughout the tenure of life insurance policies, instead of the current practice of offering high upfront commissions to distributors prevalent in some policies. Experts believe this will improve the persistency ratio (the number of policies still alive and being serviced by customers after a certain time period compared to the total sold) of life insurance policies and reduce mis-selling. High upfront commissions are prevalent in traditional life policies. Here, the upfront commission paid in the first year ranges from 35 to 40 per cent. It tapers down in subsequent years. In case of unit-linked insurance plans (Ulips), agents' commission is much lower at 6 to 7 per cent in the first year and then it falls further. One reason for this is the high competition that offline Ulips face from online Ulips, which have a lower cost structure. "Ulips may have other issues but their commission structure is not one of them," says Deepesh Raghaw, founder, PersonalFinancePlan.in, a Sebi-registered investment advisor. In case of online Ulips, the commission does not exceed 1 to 2 per cent and can sometimes even be zero. If the upfront commission is high and the subsequent commissions are lower, it creates an incentive for intermediaries to churn policies. "With high upfront commission and low renewal commission, distributors often influence customers into buying new products every year instead of continuing with their existing policies," says Santosh Agarwal, associate director and cluster head-life insurance, Policybazaar.com. "This ends up eroding the value of the investment made by the policyholder," Jain adds. If policyholders keep paying annual premium subsequently, that doesn't benefit the agent as much as if they buy a new policy. For example, if a customer pays Rs 100,000 as first year annual premium, the agent gets around 40 per cent, or Rs 40,000 as commission. But in the second year, his commission may dwindle to only 10 per cent of the annual premium, or Rs 10,000. Level commission structure already exists in health and general insurance (motor) and in mutual funds. In mutual funds, the agent's commission is a percentage of the investor's asset. Hence, his interest lies in making his client's asset size grow. In case of insurance, an agent's commission is linked to premium. In a traditional policy, it is high in the first year and then it tapers down, becoming quite small after four-five years, creating an incentive to churn. Life insurance in India has a low persistency level, especially after the fifth year. A level commission structure, experts believe, will do away with agents' incentive to churn and help improve persistency. A high upfront commission also affects a policyholder in case s/he wants to exit her/his policy early. The cost of a premature exit from a policy is borne not by the agent or the insurance company but by the policyholder. "High upfront commission is the reason why the surrender value of some life insurance policies is low," says Raghaw. If a policyholder surrenders her/his traditional policy after one-two years, s/he gets nothing. If s/he surrenders after three years, s/he gets around 30 per cent of the premiums paid so far. This figure increases gradually as the years go by, but it never becomes 100 per cent. This is because the insurance company has already paid a hefty commission to the agent. The burden of this gets passed on to the policyholder. According to experts, instead of opting for a traditional insurance plan, investors should look at a combination of term plan and mutual funds. This combination will allow them to buy a higher amount of insurance and also earn better returns on their investments, besides providing them the flexibility to exit without paying a high cost.